Some people use bleach to eliminate mildew and mold. Others sterilize objects, shine dishware and clean toilets. Bleach has become such a convenient part of our daily lives that many people tend to overlook the dangers of it. The chemical makeup of bleach is a corrosive mixture that can cause more harm than good. When mixed in certain environments it creates deadly poisonous gas. Pets are susceptible to its vapors. Direct contact with the skin can cause intense irritation and burning. Even with vast knowledge of the complicated chemistry behind bleach’s dangers, it’s never an entirely safe option. 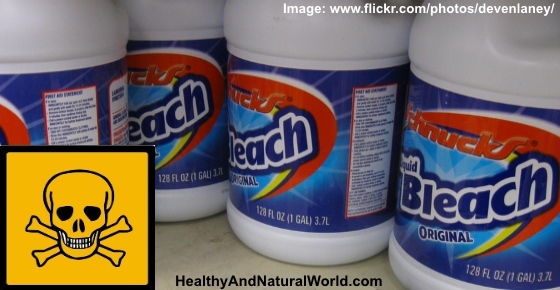 Bleach becomes an even less attractive option when you consider the wealth of safe alternatives with parallel effectiveness. The bleach alternatives listed below let you bid farewell to the dangers and noxious smell of bleach with effective and safe results. I will also share with you a simple, cheap and effective cleaners that can be used to clean the dirtier part of your house – your toilet. When you overlook the potent smell, this cure-all liquid is a home maintenance tool with a ton of useful properties. Not to mention it’s completely safe, many people even use different forms of it for cooking and condiments. You can use it to replace bleach when doing your laundry at home. For laundry, the acetic properties of vinegar will help brighten your clothes and remove leftover soap residue. Simply add 1 cup of distilled vinegar to a pot of boiling water and let it sit a few minutes. A few minutes after removing from heat, add the clothes and let them sit overnight. On the following day remove the clothes and wash them like you normally would. Further reading: 10 surprising household uses for vinegar. The greatest way to replace bleach with baking soda is during laundry. The alkali properties help when it comes to breaking down greasy stains and residue. By adding ½ cup of baking soda to your regular powdered laundry detergent your clothes will come out cleaner and with less odor than usual. Further reading: 9 uses for baking soda as a kitchen medicine. Here is a cheap, simple and effective cleaner that can be used to clean what’s considered to be the dirtiest part of the house – the toilet. Baking soda is excellent for removing stains while white vinegar has antiseptic/disinfectant properties. Both substances neutralize the odor and are safe for everyone. Pour the white vinegar into the toilet bowl and brush the toilet bowl with the vinegar. After 30 minutes take your toilet brush and dip it into the toilet to wet it. Take it out and sprinkle some baking soda onto the brush. Clean the inside of the toilet with the brush while repeating the baking soda sprinkle procedure until the baking soda is gone. That’s it – the toilet is clean. Plenty of people shy away from this product because there is slight intimidation associated with the chemical name. In actuality this non-toxic disinfectant is far safer and just as effective as bleach in several residential applications. Hydrogen peroxide can be used in the kitchen, laundry room and even the bathroom as a hygienic aid. To brighten laundry, add ½ cup of hydrogen peroxide with laundry detergent before a routine wash. Mix in a spray bottle with a bit of water and use it in the kitchen to clean cutting boards, sponges, and even vegetables of bacteria. In the bathroom you can use it for whiter nails and even as a mouthwash to kill bacteria when diluted with water (and rinsed thoroughly without swallowing). Another great alternative to bleach might be a lemon sitting in your fridge or atop a fruit basket. The acidic properties of lemon make them a non-toxic way to clean and disinfect kitchen materials such as cutting boards and trays. Not to mention they also leave behind a much more pleasant scent than bleach. To use lemon juice as an alternative to bleach, cut the lemon in half and rub it on to the affected area. You can also drain the juice and mix it with water in a spray bottle. Some people toss the finished rinds down a garbage disposal to clean them out. Further reading: How to use lemon as a medicine. Castile styled soap is made from olive oil with techniques that dates back over several centuries of Spanish history. Its effectiveness combined with natural ingredients makes it an appealing alternative to bleach. Many soaps are made of chemical detergents, but Castile soap is entirely biodegradable and safe to use around pets and family. Most people dilute the Castile soap with water and use it to clean bathrooms, dishes and cookware. It makes a great laundry detergent when combined with white vinegar, baking soda, washing soda and borax. Some have also used Castile soap as shampoo for both people and pets, floor cleaning solution, toothpaste and carpet cleaner. You can also combine a tablespoon of Castile soap with several cups of water in a spray bottle and safely clean your produce of bacteria. Further reading: The most ingenious uses for Castile soap. Borax is a mixture of a mineral and salt and has become a useful component in several applications. It’s commonly used as a detergent, in cosmetics, a fire retardant and even as an antifungal agent. It’s commonly mixed in with laundry detergent to give it a cleaning power boost, but it can also serve as a disinfectant. Its gritty properties makes it an ideal ingredient for scrubbing and cleaning dirty and grimy surfaces. When mixed with Castile soap and water it becomes a great way to scrub sinks and toilets clean. Flush the toilet to wet the sides of the bowl and sprinkle the Borax around the rim and sides of toilet. Spray the white vinegar over the Borax and allow to sit for several hours or overnight. Clean thoroughly with a toilet brush until the bowl is clean. Have you noticed that many of our household cleaners and home deodorizers have lemon and pine smells? Well, it is not an accident that we associate lemon and pine smells with cleanliness. Essential oils have the potential to kill germs, destroy bacteria and eliminate bad odor due to their antiseptic qualities. The good thing about essential oils is that they don’t only cover up bad odors, but actually change the chemical molecular structure. There have been many studies about the effectiveness of essential oils in disinfecting room air. According to these studies, essential oils are rich in components that have germ killing properties. The most well known of the tested microorganisms that were dramatically inhibited by the diffusion of essential oils was E. coli that can cause serious food poisoning in humans, and is occasionally responsible for product returns due to food contamination. Some essential oils work directly on neutralizing these harmful organisms. Dr. Jean Valnet, who was a medical doctor in Paris and was also an army physician and surgeon, experimented with essential oils in the post World War II years, and established amazing results. One of them was to demonstrate the anti-bacterial properties of eucalyptus essential oil. He found out that a 2% dilution in spray form killed 70% of the airborne staphylococcal bacteria, which can cause various infections in our body. Here is an all natural easy and effective household cleaner, that will be gentler and safer alternative to what you may be currently using and will have great deodorizing and effective germ killing properties. These are important not only at home, but in places that often have large number of people, such as gyms, schools and workplaces. Add 1/2 (half) a cup of borax to 1 gallon (4 liters) of tepid warm water. Then add 20 drops antibacterial essential oils such as bergamot, orange, lemongrass, tea tree, juniper, pine, citronella, peppermint, lemon, sandalwood, eucalyptus, lavender and rosemary. It can be used in place of your household cleaners and is just as effective as industrial strength brands without the potential harm to your health. And finally another tip – You can put a few drops of the above essential oils on the vacuum cleaner bag or filter for extra cleaning power and for additional great scent. This bleach alternative, otherwise known as melaleuca oil, is a natural essential oil with a wide variety of uses. It has been used in cosmetics to treat acne, infection and dandruff. As a bleach alternative, tea tree oil is a great-smelling way to disinfect and clean virtually any area of your home. By mixing a few drops with warm water in a spray bottle you’ll wield great tool for cleaning floors, counter-tops and appliances with a scent similar to pine. Further reading: If you are interested to learn more about essential oils you can find useful information in my e-book Magical Aromatherapy which will help you to discover the power of essential oils and the most effective ways to use them. No, this doesn’t mean buying solar panels to use in any way, just harnessing the power of the sun’s rays. If you want to whiten your laundry you can easily hang it up outside to dry where the sun’s rays can hit it. Ultra-violet light gives a subtle bleaching effect to white clothing. It’s worth keeping in mind that it might cause colorful clothes to fade however. You can also place an object outside on a sunny day and the sun’s rays will help to disinfect it. Staredent denture cleaning tablets work absolute wonders on even yellow stained toilet bowles. Simply put about three if the big round “tablets” in the bowl and leave overnight for as long as possible. Give the system a good scrub with the toilet brush before flushing and presto, the jobs done. That’s impossible- I use vinegar on my rugs… vinegar dissipates very quickly. My rugs do not smell like vinegar at all nor is there any film. What product did you use? Living in Forida I have problem with keeping mold from forming in the corner of the shower and on the shower curtain especially in the summer. I already use a vinegar solution to clean. Any ideas on how to get rid of the mold without using bleach solution? Have you tried tea tree oil? try to use undiluted tea tree oil for a small area and wipe it on the moldy area. If it’s a larger area mix 1 tsp. tea tree oil per 1 cup of water min a spray bottle. Shake well before each application. Leave the tea tree oil solution for an hour before using a brush to remove the mold.